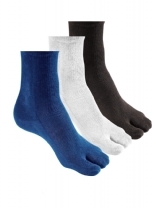 Toed Socks with an integrated elastic tension strap for correcting of hallux valgus (bunions). Available in 3 colours. Wearable in almost all shoes.